If you loved Flora and the Flamingo (which won a Caldecott Honor), then you will love the sweet, simple story that is Molly Idle’s Flora and the Penguin even more. This is a gorgeous wordless picture book featuring a young girl named Flora. She is sitting, putting on her ice skates, when suddenly a penguin pops up through a hole in the ice. Flora invites the penguin to join her and they dance across the ice – gliding and twirling in a sweeping, ballet-like dance – until the penguin dives back into the water to catch a fish. Flora is disappointed at losing her new companion, and not too impressed when the penguin returns and offers the fish to her. Much to the penguin’s dismay, Flora throws the fish back in the water. She later thinks better of it, and finds a novel solution to help the penguin catch the fish again. All’s well that ends well between newfound friends. Both girl and animal are so animated in their expressions, and Molly Idle’s illustrations are amazing in how they show movement through the flowing shapes of Flora and the penguin, and the way they mirror each other. The story also includes flaps to turn as it progresses. 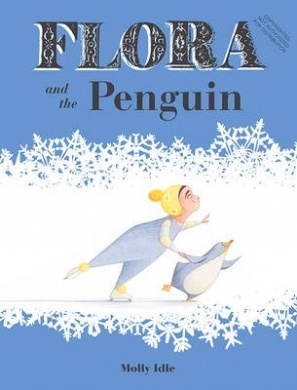 Reading Flora and the Penguin is like watching a silent movie, or a show played out on stage – the page design, with water filling the bottom third of the page, and generous use of white space for the ice in the top two thirds, adds to this feeling. I love it!